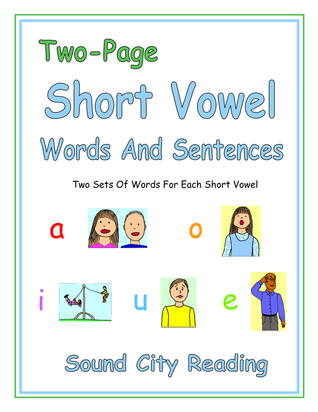 The mixed short vowel book and workbook shown below are newly revised as of January 2019. I have posted several versions of these small booklets on the old web site. This is the most recent version. The ten booklets are one fourth the size of a regular page. The booklets are set up so that students read five or six new words, turn the page, and see a group of small pictures paired with the same words. The student read the words again while looking at the pictures. The pictures reinforce the meanings of the words. After several lists have been introduced, students read one or more short sentences, which are also illustrated. The words in these booklets are set up in rhyming lists. The first booklet, Run, is numbered zero. 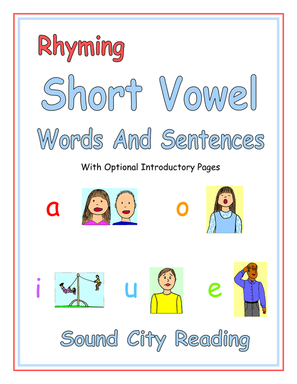 It is an optional introductory booklet that can be used while students are learning the alphabet. Students who already know all the letters and their sounds can start with booklet one, A Cat. As they work through the booklets, students learn these sight words: as, has, a, A, was, is, his, and I. This enables them to begin reading meaningful sentences. They also learn that the suffix _s is used at the end of a word to show more than one. The pages for each booklet are printed on both sides in portrait mode, stacked with the cover on top, and the whole stack is cut in half horizontally. This creates two identical booklets from each file. The booklets are then stapled and folded. I use a long reach stapler sold by PaperPro. It is spring loaded so that you don't have to apply a lot of pressure with your hand. I had to try several different brands of staples to find some that are sturdy enough to go through the pages without crumpling. I've found that Swingline Optima Jam Free Staples work very well. I print the covers on pastel blue "vellum bristol" which is similar to cardstock. I've provided a separate cover file for each booklet and also another file with all of the covers. It's easier to print all the covers at once, since you only have to adjust the settings to print the thicker cover pages from the bypass tray one time. If the instructions for making the booklets seem daunting, I am getting ready to set up these booklets to sell in the store section of the Sound City Reading web site. Click on any of the green bars to download the desired booklets.